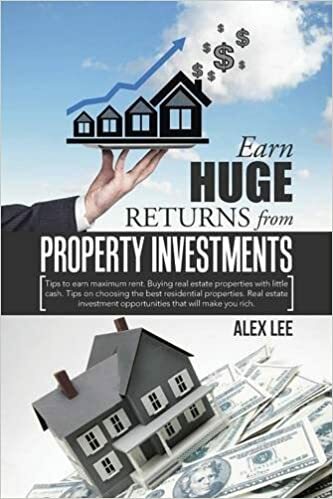 Earn Huge Returns from Property Investments: Introduction of The Book of "Earn Huge Returns from Property Investments"
Introduction of The Book of "Earn Huge Returns from Property Investments"
Tips to Earn Maximum Rent. Buying Real Estate Properties with Little Cash. Tips on Choosing the Best ... Opportunities That Will Make You Rich. This book is about A Comprehensive Guide on how to Earn Huge Returns from Property Investments irrespective of the size of your bank account and irrespective of whether you have any experience in this field. This book is dedicated to all the people who want to invest in Real Estate for a minimum of 10% Return on Investment (ROI). 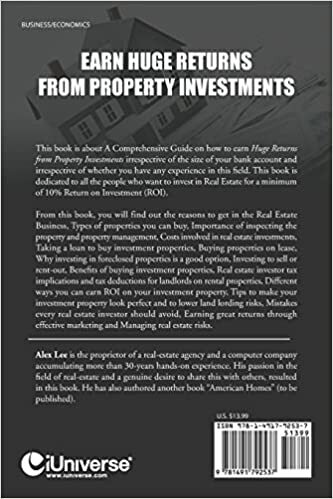 From this book, you will find out the reasons to get in the Real Estate Business, Types of properties you can buy, Importance of inspecting the property and property management, Costs involved in real estate investments, Taking a loan to buy investment properties, Buying properties on lease, Why investing in foreclosed properties is a good option, Investing to sell or rent-out, Benefits of buying investment properties, Real estate investor tax implications and tax deductions for landlords on rental properties, Different ways you can earn ROI on your investment property, Tips to make your investment property look perfect and to lower land lording risks, Mistakes every real estate investor should avoid, Earning great returns through effective marketing and Managing real estate risks. Labels: Alex Lee, Earn Huge Returns from Property Investments: Tips to Earn Maximum Rent. Buying Real Estate Properties with Little Cash. Tips on Choosing the Best ... Opportunities That Will Make You Rich.